All CUPE 23 members who receive extended health benefits are members of Pacific Blue Cross. Last year they locked out their employees, members of CUPE 1816. 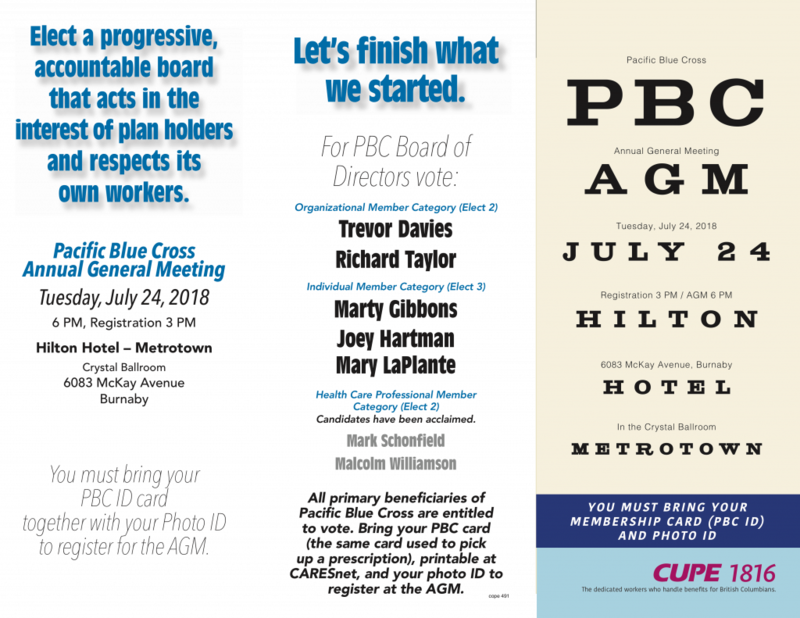 Last year over 800 union members showed up to the annual general meeting to replace half of the PBC board with directors who would respect the workers. This year we have the chance to make sure the other half of the board also value their workers. CUPE 1816 is endorsing the 5 people listed below for election to the board. Come out to the Hilton Metrotown on Tuesday July 24. Bring your PBC card and photo ID. Registration starts at 3pm, AGM is at 6pm. This entry was posted in advocacy, Community, solidarity by sbjorknas. Bookmark the permalink.